If you are looking for a character that dishes out a lot of damage, and is light on execution requirements, then Shen is your guy. Shen Woo is a powerhouse kind of character that can spend small to large amounts of meter to spill out massive damage to the opponent. His combos don't require much precise execution at all, but you will need to know how to properly hit confirm well to convert a single hit into high damage. Shen has exceptionally good normal attacks even though a few of them aren't cancel-able or chain-able into each other. His mixups can be a little on the weak side because of his lack of high damaging combos converting from a low attack (except when he has HD) but he employ his command throw (hcb,f+P) whenever the player feels that the opponent is respecting his offensive too heavily. Shen can utilize his Geki-ken feint (qcf+C~B/D) to cancel out his stand CD, his crouching C, and his f+B on block to make those normals more safe and to pressure the opponent on defense. Shen also has a few answers against projectiles. He can negate them, and even phase through them with his EX Geki-Ken (qcf+AC) and his super Geki-Ken (qcf~qcf+P). Overall, Shen is a good character for beginners and advanced players who is looking for a good anchor in their team that can deal extremely heavy damage with minimal effort and resources. Use stand A (light punch) and stand C (heavy punch) against incoming hop attacks. Crouch C (heavy punch) is good for anti-airing jumps and superjumps but it has a rather skinny and vertical hitbox, so be sure to use with caution. Use his Tamaken Reflect (qcb+C) to negate fireballs and projectiles. His EX Geki-Ken with the Normal DM and EX version of his Tatsu Geki-Ken can phase through them and punish the opponent at the right distance. For jump offense, use his jump D (heavy kick) and his jump C (heavy punch). For air-to-air, use his jump CD, but stay away from using it as a jump-in because it is vulnerable to crouching B's (light kick). s.A: 25 damage, cancel-able & chain-able, hits mid. A very quick, nice ranged jab. Good for stopping hops. Whiffs on crouching opponents, so be careful using it up close. 3+ frames on block. s.B: 30 damage, hits mid. A boot aimed at the lower mid-section. It is not cancel-able out of anything, but you can chain it from other light normals. A good poke at close range, and you will be confirming this kick into HD activation sometimes. -1 frame on block. s.C: 70 damage, cancel-able, hits mid. This gut punch is one of the few starters to many of his combos. It's quick, safe on block (-1 frame), but you will need to learn how to properly hit confirm this into his f+B or else you will missing out on good potential damage from many of his combos. far C: 80 damage, super cancel-able, hits mid. This is another good punch that you will be using to stop incoming hops. It even has auto-guard which will catch some hop attacks at the right time. The range is fairly long too. You will be using this poke pretty often at range -7 frames on block but you will be out of their range before most characters can do anything. s.D: 80 damage, cancel-able, hits mid. Sort of a high knee aimed at the chin. It would be best to use s.C over this kick because s.C is much faster (by a frame though) and is safer on block. But if you are personally more used to using this attack than s.C for combos, it won't get you killed. -12 frames on block. far D: 70 damage, hits mid. A sort of a round kick that's aimed at the midsection. Unfortunately it isn't cancellable into anything, so it can be sort of a risk to poke with this attack. The range is fairly long so you can end some juggles with this. -9 frames on block. d.A: 25 damage, cancel-able & chain-able, hits mid. Less range than his standing A, but it's still a good crouching poke that hits mid. You will probably be using this upclose (because of its distance) and for some of his crouching combos (which there are very, very few). +2 frames on block. d.B: 30 damage, chain-able, hits low. This fast crouching kick is only chainable into other normals, but it has good range for maintaining space at very close range, and a starter to limited crouching hit confirming combos. It's a pretty good poke over all, and should be used as much as possible even though it doesn't setup anything threatening if Shen has no meter. d.C 70 damage, cancel-able, hits mid. You can use this as an anti-air against those trying to jumpin at you in a very steep angle, but if you whiff it, you may be in trouble. It has a very skinny horizontal, so anything past his arm may cause this uppercut to miss. On close contact it's startup is faster than his cr.B, but is -13 on block if its whiffed. You can make it a bit safer on block by canceling it into his qcf+C feint. d.D 80 damage, cancel-able, hits low. Shen slides his foot across the floor in front of him to sweep the opponent. -8 on block but if you use his feint after it can turn into a very decent poke. You can also cancel it on block (and if its whiffs) into his qcb+A overhead or something else if you don't want to deal with its recovery frames. j. A: 45 (40) damage, hits overhead. A jumping punch that's pointed down at around a 60 to 70 degree. If you are sloppy with your jumps and hops, it might miss on during some characters cr.B's. j. B: 45 (40) damage, hits overhead. This kick points upward around a 50 to 60 degree angle. Probably good for going ground-to-air but it might get beaten out by others jump attacks. j. C: 72 (70) damage, hits overhead. This punch has a much more steeper angle pointed downward than the j. A. Use this for jumping in rather than the j. A. It's hitbox is fairly large too, and it hits down deep. j. D: 70 (68) damage, hits overhead. A pretty cool long ranged kick that has 60 degree angle with a decent sized hitbox too. Use this for zoning in mid range against characters trying to hop in at you from a distance, and for jumpins too. CD: 75 damage, whiff and hit cancel-able, hits mid. Fast shoulder shove that can even be used to stop incoming hops because of its fat sized and great horizonal ranged hitbox. You use the startup animation to kara cancel some moves like his hcb~f+P, or his qcf+A for example. If its blocked, you can qcf+C feint afterwards to give him some advantage and continue pressure. j. CD: 90 (80), hits mid. A really, really nice jump CD that has a good size hitbox which can beat a lot of jumpins air-to-air if the opponents jump attack doesn't have a good horizontal hitbox. Be careful jumping in with this, it can whiff and be punished during your opponent's crouching B (light kick). GCCD: 10 damage, hits mid. Guard Cancel Blowback Attack. It looks like his st.CD but has more negative frames on block, so try not to use this against jump attacks, they may be safejumping against you. Kokakugeki = (b/f+C/D) close 33+33+40 damage, can be broken. Shen headbutts the opponent 3 times making them fall face down. You can choose to fake them out with a sweep free-canceled into his qcb+A overhead, roll over their fallen body to create an ambiguous roll okizeme setup (hold forward to wake up on the other side, or stay neutral to wake up in front of them) or hit them with a meaty jump-in, empty jump into a low or bait a reversal, etc. Fusenkyaku = (f+B) 65 damage, cancel-able, hits mid. His forward kick to the gut from the previous version. It has good reach, cancelable by itself, best move to activate HD with and perfect to be used in most of is combos. Geki-Ken = (qcf+A/C) - Swinging punch that lunges forward. It has good startup and recovery for his A version. A version is the most abusable move in his repertoire. It's safe when blocked and is perfect to stop hopping opponents. It is a little difficult to use the C version sometimes because it cannot be comboed into, so its best to use it partially charged to catch opponents on the defense off-guard. Ex qcf+P travels farther, starts up quicker, and goes through projectiles but it is not safe on block. Gekiken (Charged) = (qcf+C) hold for 2 seconds - Fully charged C version mimicks his DM with a DM flash and does 20% damage if it connects. It has a deceivingly good vertical hitbox and crumples opponent upon connection. Guarding a fully charged punch leads to only taking away 50% on majority of the cast, while taking 40% on characters like Ralf, Clark, Daimon, etc. This feint can be used for three purposes. First purpose is against a defending opponent to constantly give them the possibility that a normal or even partially charged qcf+C may be released at anytime. During the feint you can also AB roll which can save you against something harmful coming at you at the last moment you decide to feint. The second purpose is building meter. Doing the qcf+C by itself gives you meter, but when you feint you gain the same amount without having to openly whiff the punch. The third and last purpose is to cancel some of Shen's normals on block to give them less recovery and more frame advantage; making them a bit more safer. The only normal you cannot cancel into the feint is standing and crouching B. This can be very useful for Shen's offense, granting him a bit more movement and pressure against a blocking opponent. Fuku Tora Geki = (qcb+A) - Two-parter starting with his double hand overhead then swinging back upwards launches the opponent for a low juggle (can be Super Canceled (SC'd) into his qcf x2 + A/C DM). It retains its overhead properties despite being in a block string; however, it is not safe when blocked if your opponent has a fast countering move. Unlike XII, he can cancel his qcb + A off of his command attack f + B. Extremely useful in his mix-ups and most damaging special to SC off of. EX version juggles opponents higher (high enough to connect his qcf x2 + A/C DM). ∟ Kanyuu Ryugeki = (qcf+A) - Second part of the Fuku Tora Geki. This move is not safe if blocked. Tenrenken = (qcf+K) - Lunges forward with a sliding grounded uppercut. Not as useful for anti-air as XII as he slides forward even with the B version. Only useful for anticipated hops and maybe some jumps. D version combos off his BnB s.C, f.B chain, and is also safe on block. Ex version is much more useful, does an added hit and allows for juggles but is not the anti-air move that you would expect. Follow up with a qcf + D for juggles (otherwise opponent is too high and falls down vertically). Tamaken = (hcb~f+P) - Command throw which combos off his f.B chain and even his light attacks if he's close enough. Without any drive canceling or super canceling, this is his strongest comboable special (even slightly stronger than Shen Woo Hammer). Can be kara-canceled from his stand CD for more range. Ex version crumples the opponent and allows for jugglable followups like DM, qcb+A, or qcf+BD. Tamaken Deflect = (qcb+C) - Reflects incoming projectile. You can cancel the ending frames into any move however the most practical one is C Shen Woo Punch Lite and cancel if needed. Tatsu!! Gekiken! = (qcfx2+P) - Buffed up version of his of Shen Woo Punch Lite. It does good damage and is invincible after startup. Ex version is much faster. You can try to use this as a last ditch anti-air attack against full or half screen jumps, but there is an extremely high chance that the opponent may safejump it, if you perform it too early or too late. If you whiff this DM or if its blocked, Shen is completely open for punishment. Bakuten = (C,A,B,C) 2 stocks - Causes Shen Woo to explode and glow yellow like SSJ. The explosion itself does about 312 dmg which includes his increased attacked damage of 30% while in this mode and he also increases his defense by 17%. Note: In the Bakuten mode you do not build drive or stocks for yourself. Tensho Bakushingeki = (qcf~hcb+AC) - Fast chase down punisher. Shen glides across the screen and activates an upwards punch sending a blast upwards. Projectile invincible and slides underneath most moves. Punishable if whiffed or blocked. A good finisher to a majority of his HD combos. There are so many variations to his HyperDrive combos (HD) so it's really about picking your own poison. Fortunately, all his (Ex) DMs juggles so SCing/MCing isn't a problem. j.C, s.C, f.B, HD, s.C, f.B, qcf A, [HDC] qcb A.qcf A, [HDC] qcf D, [HDC] qcf C, [HDC] qcf D, qcf A, [HDC] qcf D, CABC, [MC] qcf~hcb+AC NM. (6b) (http://www.youtube.com/watch?v=nWMFqrGXypI) 4leaf's Shen 4 hit 100% combo. 1. st. A > cl. C - 2 frame gap between st. A and cl. C. St. A whiffs on crouching opponents, except on Daimon, Raiden, and Maxima. 2. st. A > cr. C (L) - 1 frame gap between st. A and cr. C. St. A whiffs on crouching opponents , except on Daimon, Raiden, and Maxima. 3. st. A > cl. D - 3 frame gap between st. A and cl. D. St. A whiffs on crouching opponents, except on Daimon, Raiden, and Maxima. 4. cr. A > cl. C - 3 frame gap between cr. A and cl. C.
5. cr. A > cr. C (L) - 2 frame gap between cr. A and cr. C.
6. cr. A > cl. D - 4 frame gap between cr. A and cl. D.
7. cr. B > cl. C - 3 frame gap between cr. B and cl. C.
8. cr. B > cr. C (L) - 2 frame gap between cr. B and cr. D.
9. cr. B > cl. D - 4 frame gap between cr. B and cl. D.
10. tip of qcf+D (+2 on block) > st. A - 2 frame gap between tip of qcf+D (+2 on block) and st. A. St. A whiffs on crouching opponents, except on Daimon, Raiden , and Maxima. 11. tip of qcf+D (+2 on block) > cr. B - 3 frame gap between tip of qcf+D (+2 on block) and cr. B. A. Blocked (cl. C, qcf+D): This is not a true block string. The opponent has time to any invincible reversal or roll to not block the tip of qcf+D. Use this string cautiously. B. Blocked (cr. D, qcf+D): This is not a true block string. The opponent has time to any invincible reversal or roll to not block the tip of qcf+D. Use this string cautiously. C. Blocked (close st. CD, qcf+D): This is a true block string. Athena can only punish Shen's qcf+C half charge (which is -3F on block) and qcf+A with her hcf+P command throw. Shen's blockstring of cl.C, f+B, qcf+D can only be punished by Athena's hcf+AC EX command throw. 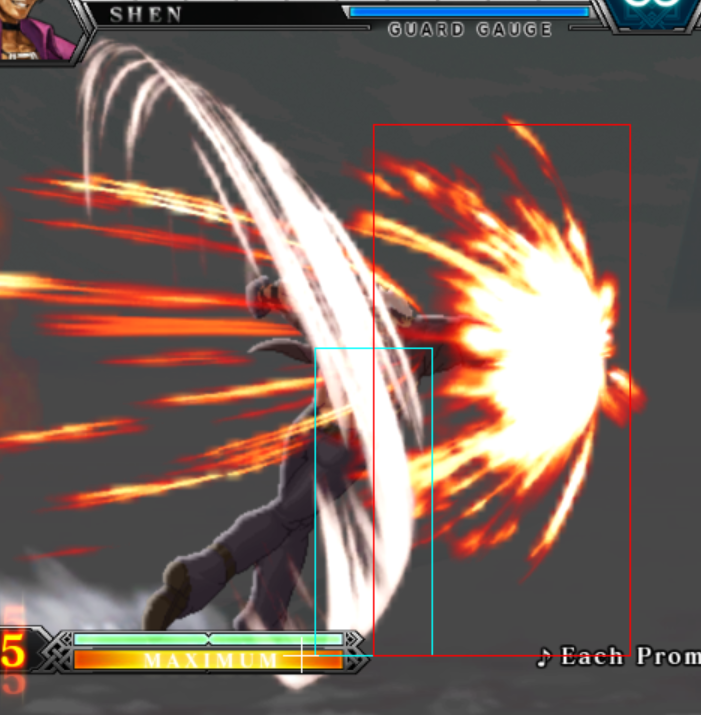 Quickly punish Elisabeth's dp+AC on block with qcfx2+AC. Kim's air qcb+B can be punished on block with Shen's down C, or his hcb~f P command grab. His air qcb+D is a bit more safer on block so its only a good to use his command grab on block. His qcf+C is rather safe too, but not against Shen's qcfx2+AC, hcb~f+AC, or his crouching B. His hcb+C follow-up rekka is hard to punish too, but his qcfx2+P and his Neomax can punish it. Takuma's db~f+B on block can be punished with Shen's cl.C up close, but it's harder to punish at it's max distance, though. Try using cr.B or stand B to punish it on block at its farthest distance. Takuma's db~f+D on block is much more easier to punish with Shen's normals than the B (light kick) version at any distance. It's very hard to punish Takuma's db~f+BD at any distance, but you can try a hcb,f+P or EX hcb,f+AC if the opponent doesn't press any buttons after it's blocked. Yuri's hcb+BD at very close range on block can be punished with a sweep, or a quickly executed qcfx2+AC. At farther ranges, Shen's qcfx2+AC can hit Yuri right after she bounces back into a standing position.